Today we played with Christmas play dough! I followed a basic play dough recipe with flour and salt (I won't share mine because the measurements are not exact and I end up having to add a lot more flour, I really need to find a better recipe!) but I also added green food colouring and peppermint extract. Ethan really enjoys playing with play dough. 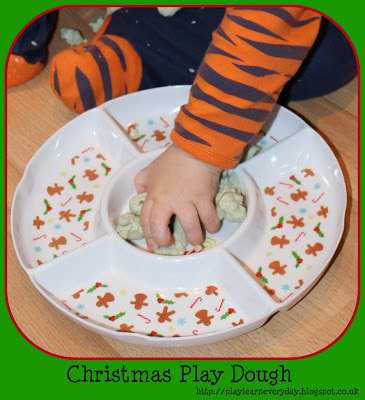 It is a great sensory activity as he sees, feels, smells and attempts to taste the play dough. This helps to develop his Knowledge and Understanding of the World as he explores all of the aspects of this mysterious material.